My Turn: There are items we carry through life that help tell our stories. These are mine. Craig and I met at a Presbyterian youth group. He was Charlie Brown to my Lucy in a church production of You’re a Good Man, Charlie Brown. We asked each other to the ninth-grade semiformal, saving both of us from having to go with someone else who might actually want to make out, or slow dance. Instead, we tangoed across the dance floor with sweeping steps during every slow song that night, proving we were all at once zany and free from the teenage bonds of uncomfortable young love. On weekends, we sometimes rode the train to Philly for incense and adventure. Then we’d sit by the art museum fountain, light some incense and mark the time to see how much longer his Marlboro 100s lasted, compared with my Salem Lights. It later occurred to me that maybe Craig wanted to like me as a girlfriend but couldn’t bring himself to cross that line. He finally told me one night, about five years out of high school, that he had a boyfriend. I’d already figured it out, with my rudimentary reporter skills. “I know,” I said, hugging him tight, mostly so my tears soaked into his jacket before he could see the manifestation of my fear, that this new AIDS virus I’d read about was inevitable. As for Irene, we became BFFs in fifth grade. Our sisterhood was solidified during middle school by ’70s funk, Wolfman Jack’s “Midnight Specials” and the day her father left home, never to return. That was the beginning of her unraveling. Over the years, I’d gotten pretty good at gathering up her loose ends and tying them off, best I could, with unconditional love. I lost Irene for a time, to life and circumstances. But today we are closer than ever, even across the 350 miles between us. Craig, our mutual “teddy bear,” is relegated to memory, a casualty of fast living and loving. His heart was failing by 40, and the HIV disqualified him from a transplant. Although I can’t find the store credit receipt I received from Target in January for a gift return, I have carried the joy and the weight of these two cherished friendships with me for 40 uninterrupted years, tucked in an inconspicuous fold of my wallet. In 1976, I had to select my high school ring from a catalog. It didn’t take me long to settle on a silver pinky ring with a black onyx stone. I mostly just wanted something unique as possible, anything but the kinds of rings I knew my Class of ’77 peers would select – shiny gold with starburst birthstones in happy primary colors. Onyx was supposed to represent inner strength. If nothing else, I was certain my ring would be one of a kind. In hindsight, it was the obvious subconscious expression of my teenage need to prove myself unique in a sea of typical teens. I couldn’t have known how unique my journey would be. By the time I graduated high school, I was a mom. My college dreams, deferred. The day my pinky ring arrived during senior year, I picked it up from the office, took it home and tucked it directly into a little jewelry box for safe keeping. It felt irrelevant. It’s the only jewelry of my youth that I’ve managed to not lose. I have never worn it. But it will always represent who I thought I was at 16, and everything unexpected I have become. It couldn’t be more relevant. I married young. Jim and I were 19, and we wouldn’t even own a car for a good year or more after that. But somehow, my husband-to-be saved up enough to buy me a beautiful marquise engagement ring. He left work at the sheet metal shop one night after putting in some overtime and ran several miles across town to the mall, just before closing, to invest in our future. It’s interesting to note that, over all these years, my husband has been through three or four wedding bands. I most recently replaced his ring last year on our 35th anniversary. By contrast, my ring has never left my finger. Except once. Several years ago, I caught it on a metal door handle of the Sears at the Mall of New Hampshire, which collapsed the ring around my finger like a vise grip. I took it to a local jeweler and had the urge to ask whether it could be reset with four small birthstones, one for each of my kids. It could, she said, but I’d need to replace my wedding band, which fit like a jigsaw piece into my old setting. I considered that some 25 years into marriage, the ring of my youth no longer represented who I was. Or rather, it wasn’t sufficient in expressing who I now was. I paid extra for the updated setting, which I love, and decided to pass on a replacement wedding band. Time – and Jim – have taught me that a ring can be lost or replaced, or even modified. The commitment part of a relationship doesn’t magically come from the actual rings you swap at the altar, or even from the engagement ring you update 25 years later. It comes from everything that happens in between. My father is an artist who has dabbled in every medium. One of his phases was jewelry, most of it copper enameling using a tiny desk-top kiln, something I remember watching him do as a kid. Before he discovered copper, and long before I came along, my father tried his hand at silversmithing and, to my knowledge, produced only one thing: a slender silver ring with a squiggly design on top. He never wore it. It was kept in a small ring box on top of his dresser. And while I guess I was always aware of its existence, I never knew that he’d actually made it until I asked him about it last year, while poking through some of his stuff. I also am not sure why he made that particular ring, or why he never wore it, but that day, out of curiosity, I slipped it on my finger and it was a perfect fit, a wearable piece of art that feels like it was made just for me. My mother was born in 1918, one of two daughters of George Riddle Allen and his wife, Mary. By the time I came along in 1959, her father was long gone and her mom died a few years later. My earliest memories include sneaking into her bedroom while she napped and quietly lifting the locket from her jewelry box, then prying it open with my tiny fingernails. I would steal a few minutes more to look at the face of the mystery man pictured inside, peering back at me from behind a tiny pane of shattered glass. 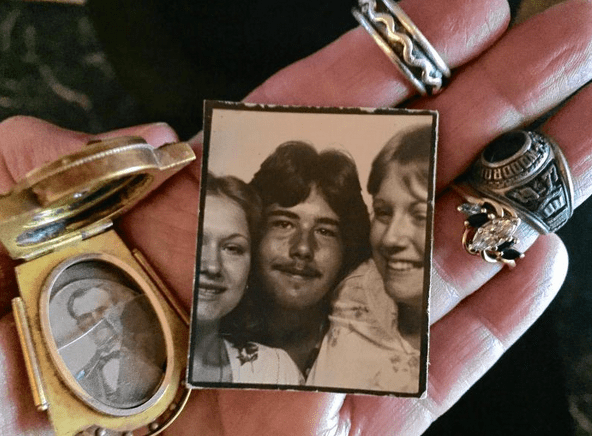 Although it probably didn’t need to be, I kept my relationship with the man in the locket a secret, for fear my mother might scold me for “playing” with her old locket. Worse, once discovered, she might move it to someplace unknown to me, where I couldn’t get my hands on it anymore. When my mother died in 2004, the locket was the only thing I wanted, feeling it was somehow always mine. This past January, mom’s sister Marian died at 93. I flew to Indiana for her funeral and returned with a small pile of old photographs. One of them is of my mother’s mother as a young girl, pictured with her parents and brothers. Her father – my great-grandfather – is the man inside the locket, the mystery man of my childhood, finally revealed. 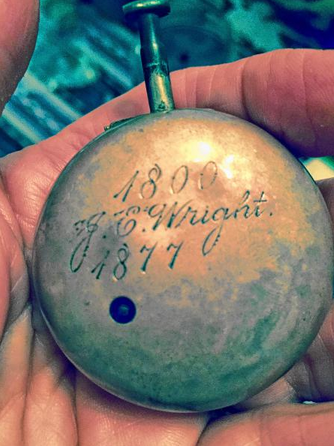 While in Indiana for the funeral, my cousin Fred and I found an old pocket watch in his mother’s steamer trunk. He said I could have it. Like the locket, I discovered the watch has a metal shell that can be pried open if you slip your fingernail just so into the silver crease. On the back of the watch is an inscription, “JE Wright, 1800-1877,” a new cherished item to keep, a new mystery man yet to discover.